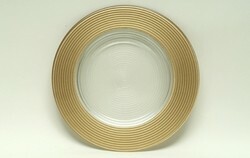 ChargeIt by Jay Gold Glitter Glass Round Charger Plate 13"
Home > Products > ChargeIt by Jay Gold Glitter Glass Round Charger Plate 13"
Impress guests by presenting multi-course meals on top of the ChargeIt by Jay Round Gold Glitter Round Glass Charger Plate 12". Elegant and sophisticated, this charger plate is beautifully designed with gold glitter edging that adds a visual flair to any upscale dining establishment. Made from high quality solid glass, this charger plate boasts a delicate look that belies its unparalleled strength and durability. Perfect for banquets, lavish parties, and wedding receptions, this charger plate not only complements your table setting but also protects against spills and mess.